Pizza is one of our favorite foods, probably because it allows for creativity and is easily customizable. 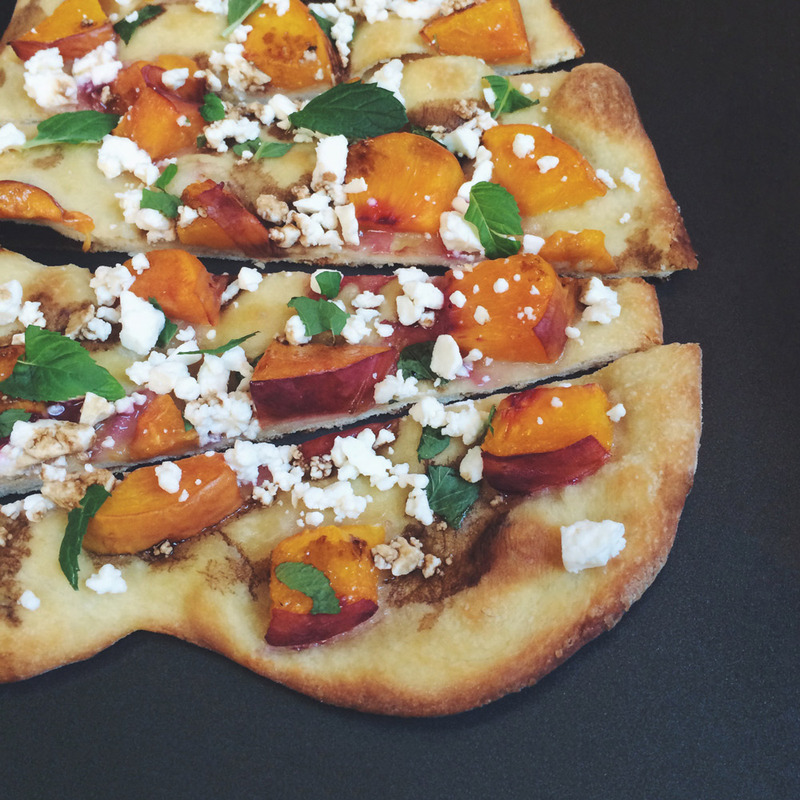 We created this summer peach pizza one day when we had perfectly ripe peaches and some homemade pizza dough in our freezer. If you are like Jen’s mom and (think) you don’t like mint, try fresh basil instead. For this pizza we strongly recommend taking the time to make a pizza dough with yeast and letting it rise. The minimal toppings need a light, fluffy crust and this recipe is our go-to! The crust is perfect every time and it freezes well after it rises. We suggest making a double or quadruple batch and keeping personal portions in the freezer for those days when you just need a pizza! Simply thaw on the countertop for 3-4 hours, until room temperature. Microwave beer in a small microwavable bowl for 25 seconds. Stir in yeast and olive oil. Let stand for 5 minutes, until foamy. Attach dough hook to stand mixer. Combine flour and salt in mixing bowl and add beer mixture. Stir until dough cleans the side of the bowl. Knead on low speed for 5-10 minutes or until smooth and elastic. Roll into a ball and dust with flour. lace in medium bowls then lightly cover with a towel. Keep the dough in a warm place for 1 ½ hours until the dough is doubled. At this point use immediately or freeze in a freezer bag until you are ready to use. Roll out the crust and coat with the olive oil. Top with peach slices and bake for 15-20 minutes, or until the crust is golden brown. Remove the pizza from the oven and top with the mint, feta, and splashes of balsamic vinegar. Add salt to taste and enjoy! slightly warm or at room temperature.